The machinery park of a City Council is always proportional to the size of the municipality. That is true for a purely budgetary issue. But it is not fair. Your City Council can not afford a vehicle for the collection of pruning, another for small public works, another to automate the cleaning of the streets and another to, for example, remove snow accumulated in the streets. Therefore, you can not have any vehicle, so none of them can do everyone’s work. PIQUERSA has developed the DUMPER KIT, a true multifunctional capable of developing the most diverse tasks just fitting the corresponding kit. 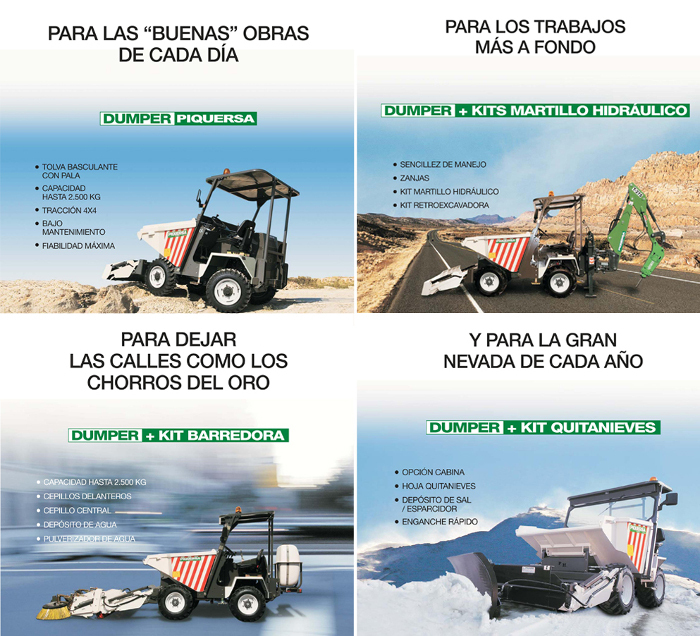 Simple to handle, robust, tireless and extremely versatile, the PIQUERSA DUMPER KIT is the solution of profitability and efficiency that your City Council needs. A small space in the municipal offices will be enough to have a self-loading dumper, a sweeper, a hydraulic hammer and a backhoe for ditches or a snow plow.